I interviewed Curtis Granderson during the 2016 World Series in his hometown of Chicago, the morning after he received the prestigious Roberto Clemente Award for his humanitarian efforts, especially helping children. He was giving a tour of the new University of Illinois-Chicago sports facility that he made possible with an endowment. After that interview, I asked him what hit meant the most to him and why, and the result is on page 37 of DIAMONDS FROM THE DUGOUT. I hope you will enjoy Curtis' offering, complete with a powerful everyday life lesson. I extend my thanks to the Dodgers' left fielder, a 300-double, 300-homer club member and postseason regular, for the kind book recommendation that he posted on Twitter! 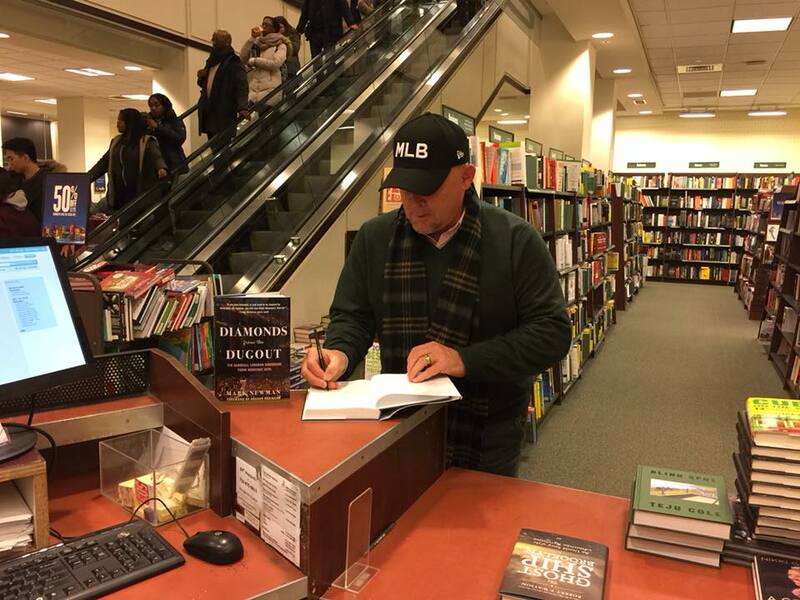 Wednesday's signing at Barnes & Noble Court Street in Brooklyn was the 39th BN store across the country I have hit on the DIAMONDS FROM THE DUGOUT book tour since our October launch, and Thursday was the milestone 40th at the BN Fifth Avenue location at 46th Street. You can visit the Book Tour page here at marknewmanbooks.com/tour and see the stops. Thanks to all of the amazing BN team members I have met along the way, starting with our launch at the Evansville (IN) location, followed by The Grove in Los Angeles and Fort Lauderdale and St. Louis and New York, Connecticut, Pennsylvania, New Jersey and Delware visits as well. 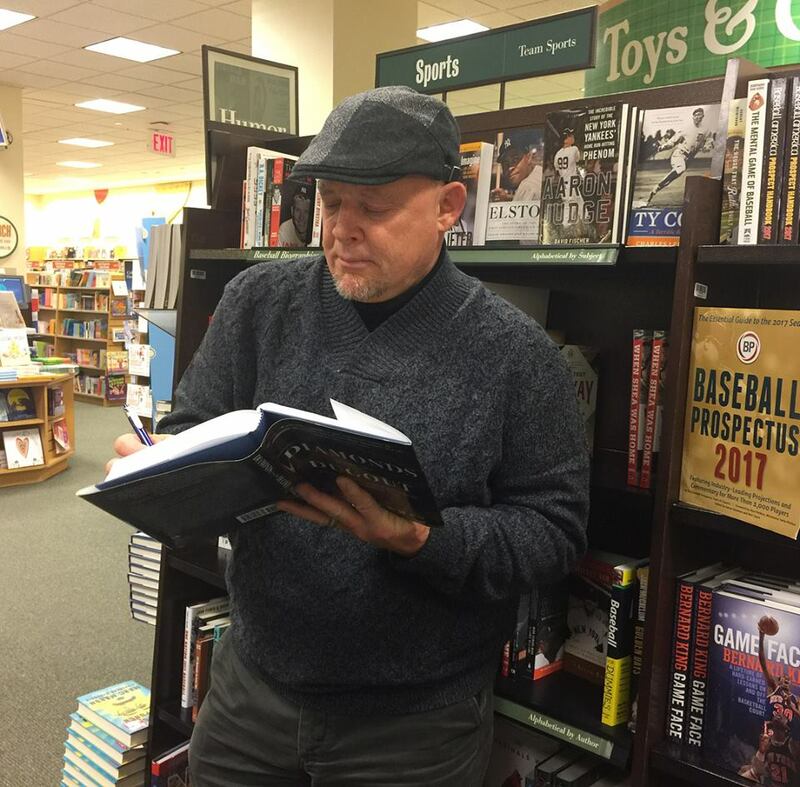 That's a lot of signed copies of the book Cal Ripken called "the perfect gift for any baseball fan," and I also want to say thanks for everyone who has gone to those stores and snapped them up! Please make sure you like the official Facebook page at facebook.com/MarkNewmanAuthor and follow instagram.com/marknewmanauthor so we can share our experiences with the book! On Sept. 6, 1995, I was in the press box at Camden Yards covering Cal Ripken Jr.'s 2,131st consecutive game played for the Baltimore Orioles, the night he somehow surpassed Lou Gehrig's "unbreakable" record. I also treasure the memory of standing next to Cal as he signed every last autograph on Main Street out front of the National Baseball Hall of Fame & Museum at about 1 a.m. the night before he gave his Hall of Fame Induction speech in 2007. This post today by Cal on his Facebook page ranks right up there on my own thrill-o-meter from No. 8. Humble thanks to Cal for sharing his memory and lesson of his own personal favorite hit (it has to do with his father), and thanks for this endorsement of DIAMONDS FROM THE DUGOUT! This is from his Facebook page. "A great new baseball book from Mark Newman... Brooks even wrote the foreword!" Cal's must-read #DiamondsFromTheDugout is perfect for all baseball fans. Grab your copy here: marknewmanbooks.com. 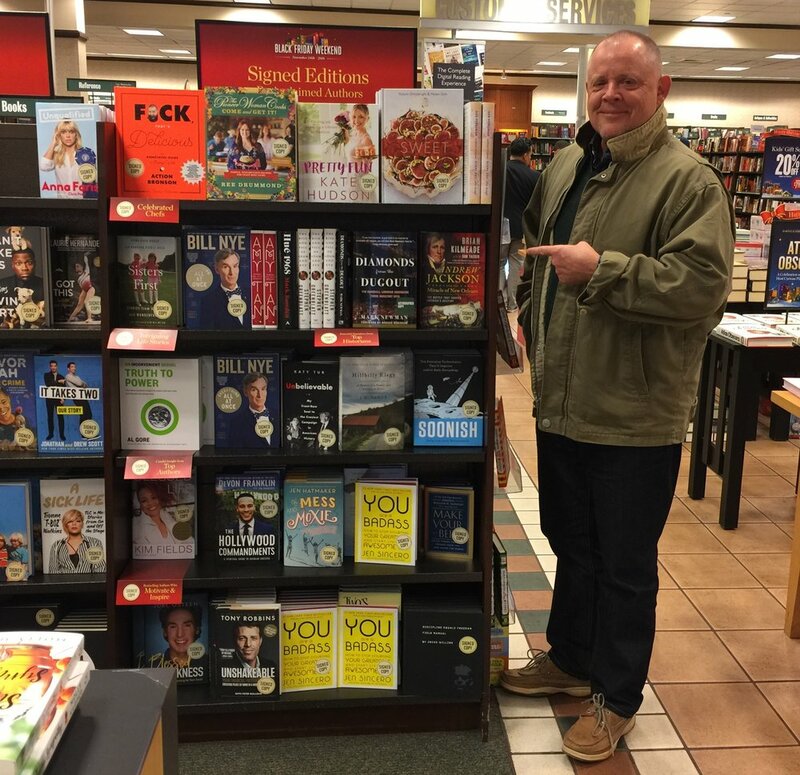 From Friday through Monday, I signed each day at Barnes & Nobles stores throughout New Jersey and New York, bringing the total of BN stores visited to 38. This past weekend included a Barnes & Noble author event at Paramus (NJ) on Friday night, then the third consecutive weekend of #BarnesandNobleStormingTour store signings within the Northeast, then a meet & greet event at Barnes & Noble in Nanuet (NY) on Sunday, and then a visit to Staten Island to sign many books they have in stock. That was pretty cool, considering I usually am running over the Verrazano Narrows Bridge in the opposite direction for the NYC Marathon! Great stores! 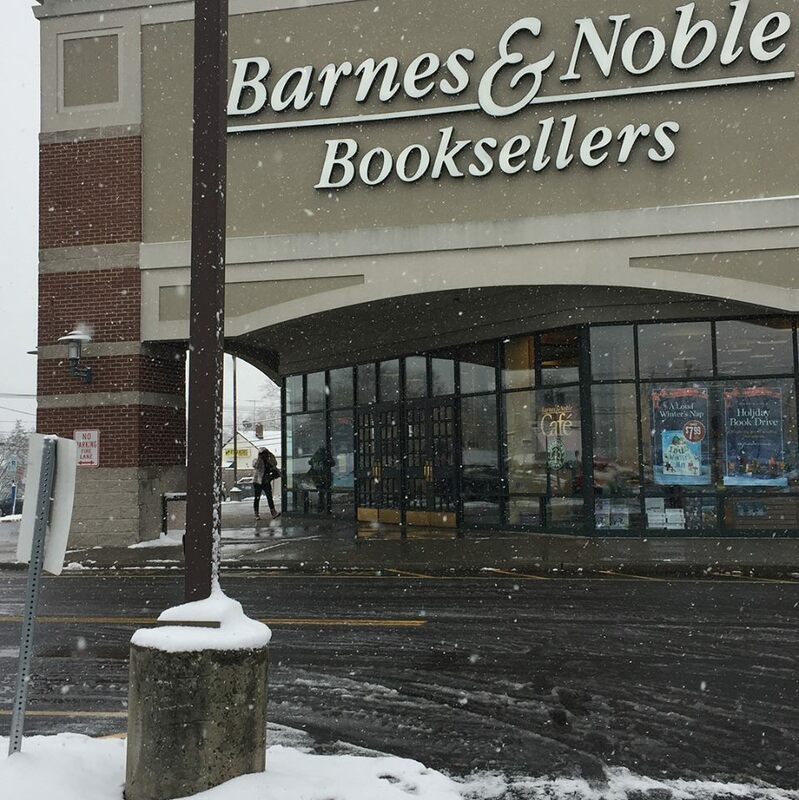 The first #BarnesandNobleStormingTour across 9 Connecticut BN stores was such a success, the Jeep made the trip on the next weekend through crazy snow and to 10 BN stores throughout New Jersey, Pennsylvania and Delaware. This #BarnesandNobleStormingTour went to: Clifton, Clark, Edison, East Brunswick, Princeton, Moorestown, Cherry Hill (all in NJ on Saturday), then Rittenhouse Square in downtown Philadelphia (after 20-minute MLB Network Radio appearance to talk about the book while parked outside the Philly store! ), Concord Pike in Wilmington, Delaware, and finally Freehold (NJ). See the @MarkNewmanAuthor Instagram page for all the posts with a ton of pics and videos, and thanks to the BN stores that also posted about the signings! This has been an incredible journey, not just getting a book from manuscript to market, but this holiday season of helping to put DIAMONDS FROM THE DUGOUT into eager baseball fans' hands for gifts! 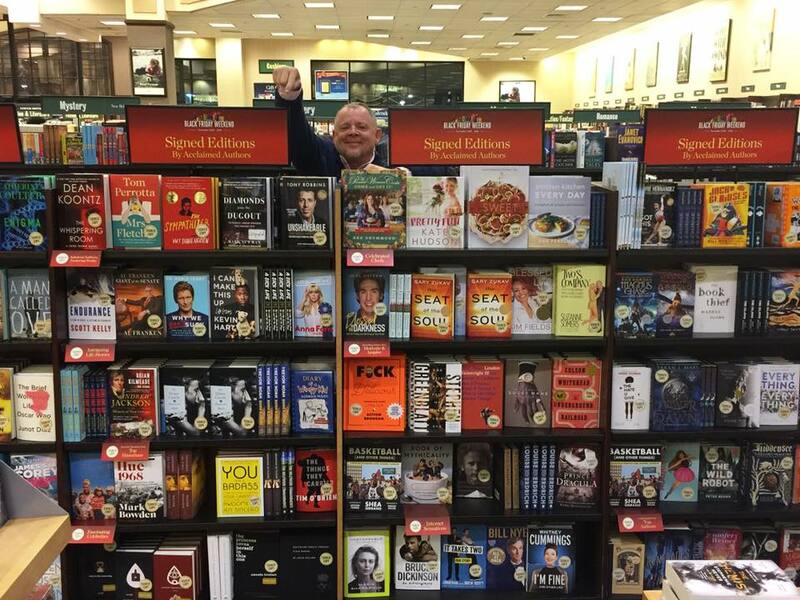 All those stores now have signed copies waiting for you, at least while they last. Give them sticker copies for a gift! 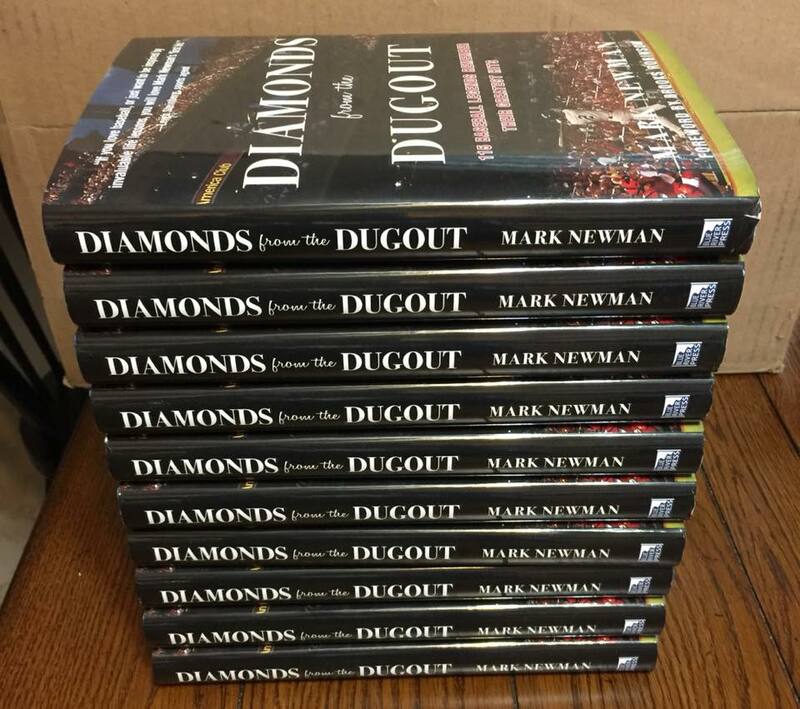 Thanks to this reader who liked DIAMONDS FROM THE DUGOUT so much, he had 10 of them shipped from Amazon to me so I could sign them for his buddies and ship them back to him to distribute perfect holiday gifts. Enjoy, Doc! Always nice to see my book next to Chipper Jones' BALLPLAYER book in the BN Sports section, and also nice to see him endorse DIAMONDS FROM THE DUGOUT to 1.2 million followers! Bestseller currently No. 82 on BN.com, keep it going! The DIAMONDS FROM THE DUGOUT official book tour page is updated with Saturday's #BarnesandNobleStormingTour. 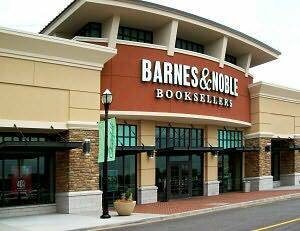 Bingley and I drove to nine Barnes & Nobles all over the state of Connecticut in one day: Stamford, Westport, Milford, North Haven, Glastonbury, Manchester, Enfield, Farmington and Waterbury. Sorry, Danbury -- couldn't make it there before 10 p.m. close! 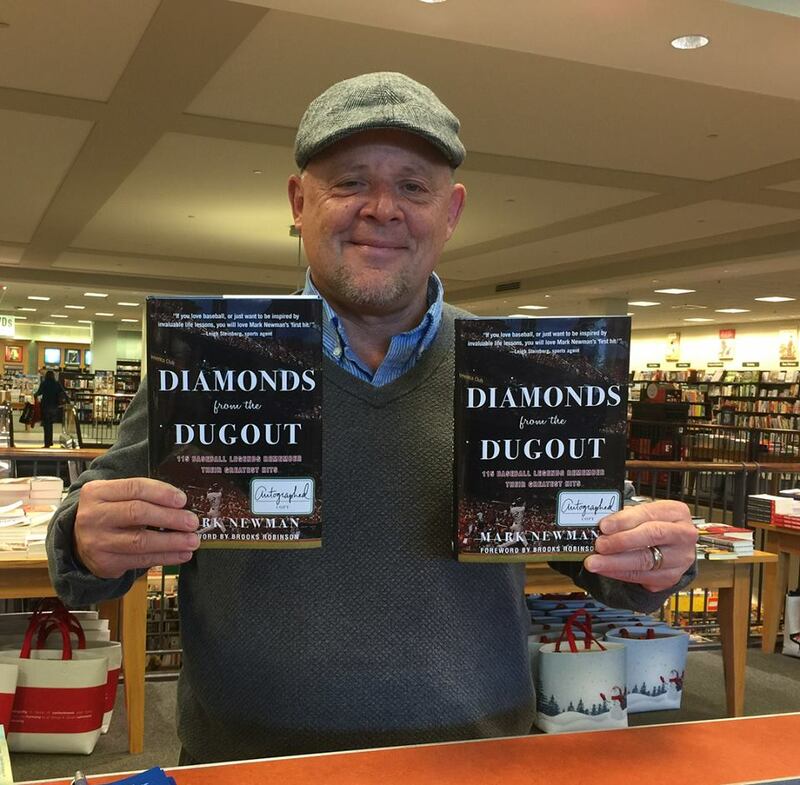 That's 21 Barnes & Nobles across the United States and counting on the DIAMONDS FROM THE DUGOUT tour. 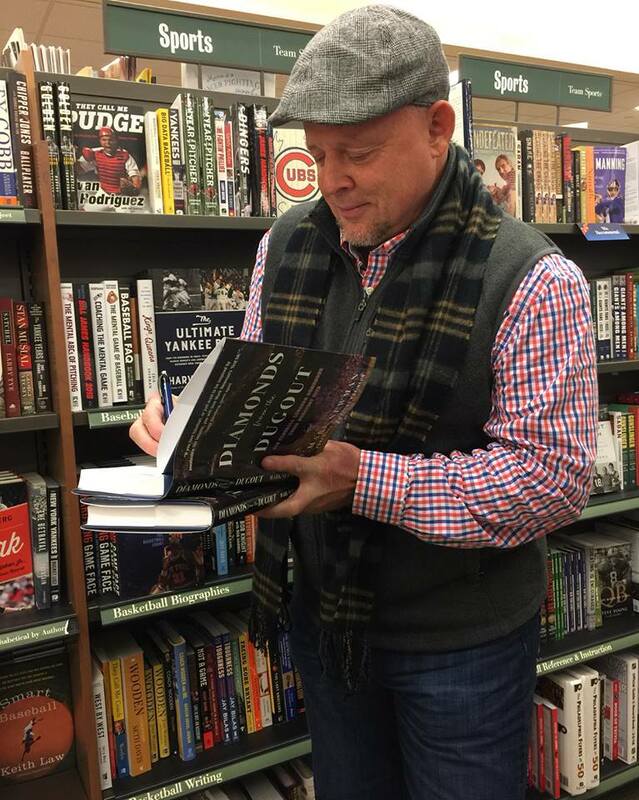 Grab "the sports book of the holiday season" for family and friends! I just mailed back my 2018 Baseball Hall of Fame ballot. Barry Bonds, Roger Clemens, Chipper Jones, Edgar Martinez, Jim Thome, Scott Rolen, Curt Schilling, Mike Mussina, Larry Walker, Vlad Guerrero. Read my 6,000-word blog post analyzing my entire top 20. While I did not agree with Joe Morgan's email to voters -- neither the message nor the delivery -- I appreciate him being a part of my new book DIAMONDS FROM THE DUGOUT. 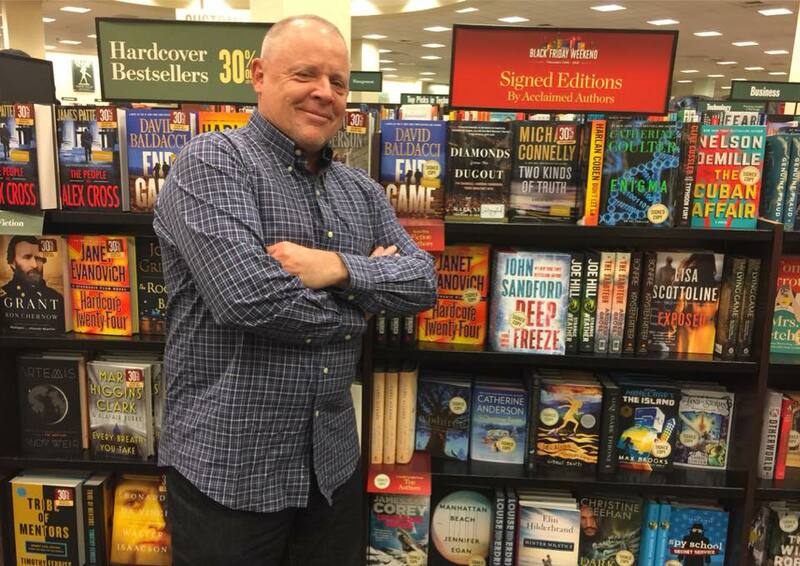 Signings over the past week have included Barnes & Nobles at Union Square, Upper West Side, Upper East Side, Yonkers, White Plains, Paramus and Palisades Center -- all in the Greater NYC area. 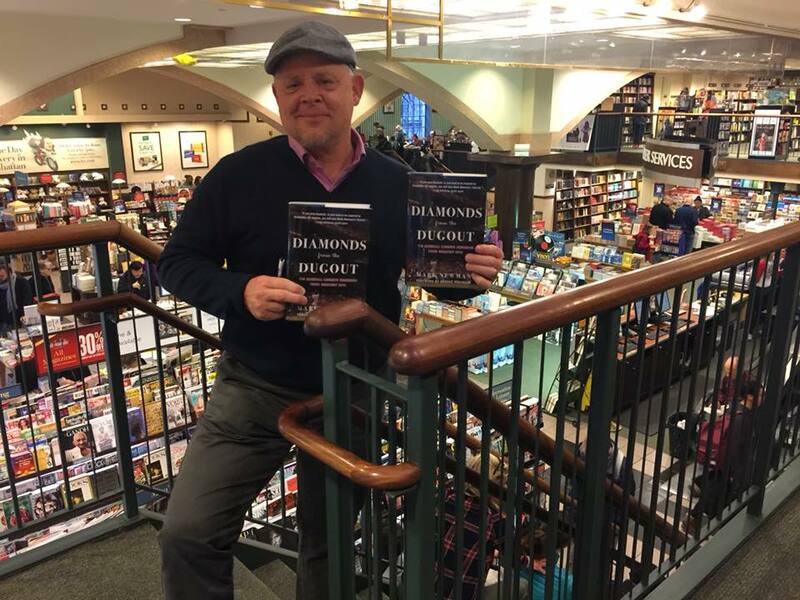 It has been so great to talk books and baseball with individual team members at those BN stores, and I deeply appreciate their efforts to display DIAMONDS FROM THE DUGOUT in great locations, from face-out display on the Sports shelf to the BN Signed :Editions by Acclaimed Authors section at the front of some stores. Visit the DFTD Book Tour page here for more info. You won't find a better person than Brooks Robinson, and it was so nice to spend time with him in the cocktail reception before this month's Major League Baseball Players Alumni Association 18th annual Legends for Youth Dinner at Capitale in Manhattan. 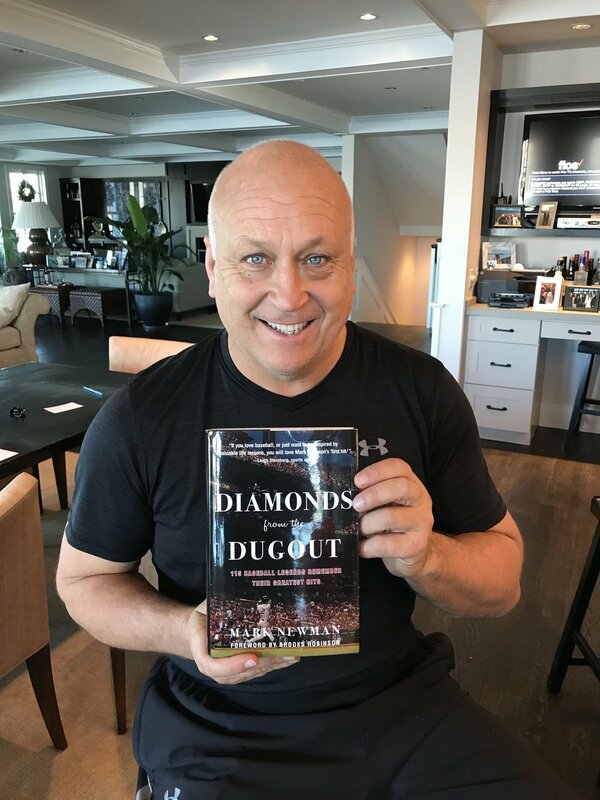 We had fun talking about DIAMONDS FROM THE DUGOUT, which he helped make possible by providing the Foreword as well as the first insightful interview response about nine years ago that moved this entire project toward what became a well-received baseball book filled with everyday lessons. I'm proud to say that the book also benefits the Constance & Brooks Robinson Foundation, which helps important causes. I knew it was all meant to be when he agreed to write the Foreword on the very same day last April that I was inside Camden Yards posing with one of his statues. True story. Among the photos I took below is one of the 1955 Baltimore Orioles team stats, which is on a club-level hallway at the ballpark. If you look closely at that, you can see that a rookie named "Brooks Robinson" was 2-for-22 that first year, and that explains why he chose the hit that he did for this book! Don't miss his story and Foreword. Thanks to my fellow Sporting News alum Justin McGuire for having me on his Baseball by the Book podcast! DIAMONDS FROM THE DUGOUT is episode 94 there. Click here to listen. Thanks to John Vorperian for having me on for an episode of his respected and long-running TV/Internet show "Beyond the Game" in White Plains, N.Y. It was fun to talk baseball and DIAMONDS FROM THE DUGOUT in the studio. CLICK HERE TO WATCH. The show originally aired on White Plains Community Media for Westchester County viewers on Nov. 3 and 4. If you want to see it there on TV, it will air again on Friday, Nov 24, at 9 p.m. ET, on Fios 45 and Altasce 76. Then it will air on Saturday, Nov. 25 at 1 p.m. ET. I love Jim Kaat's smile, and there's a very good reason. At the very outset of DIAMONDS FROM THE DUGOUT, I share the story of my first actual attendance at a Major League Baseball game. Jim was pitching for the Minnesota Twins at home on July 24, 1962. I was TWO! (Almost three.) I was there with my Mom as guests in the Twins player wives section, sitting next to Harmon Killebrew's kids, because my Aunt Sue was married to Johnny Goryl, then a Twins infielder. That was the night that Jim's teeth were knocked out on a comebacker against Detroit, and today at the MLB.com studios in Manhattan we talked at length about what he remembers and what I was told. You won't believe what Jim did in the following days, based on how pitchers are treated today. Jim's story in the "Outwork Everyone" chapter of DIAMONDS FROM THE DUGOUT is priceless, and we both hope you will enjoy reading it and learning an everyday life lesson. I'll be at the MLB Players Alumni Association's annual Legends for Youth Dinner on Tuesday night to report for MLB.com, and Jim will be there along with others who appear in my book (Brooks Robinson, Andre Dawson, Tony Perez among them). It was my honor to sign this book for Jim, though I am sure his signature is a lot more valuable. Kitty Kaat for Cooperstown. Thanks for the memories, Carlos! Thanks to Carlos Beltran for 20 beautiful years of Major League service. It was a joy to be around him through the years, including an interview with him in the Astros clubhouse long after he had amazed everyone in one game at the classic 2004 NLCS against the Cardinals. What a show he put on back then, and what memories he gave us over two decades. I also remember covering his 2013 Roberto Clemente Award ceremony, and what it meant to him being up there with Vera Clemente in honor of her late husband -- Puerto Rican legends. I am so honored to include Carlos' personal favorite hit among those 20 years, and now that he is walking into that sweet night of baseball retirement, now is a good time to turn to his page and see what he chose! Think you can guess? Thanks Bill Ladson for having me on the MLB.com Newsmakers podcast to talk about DIAMONDS FROM THE DUGOUT! You can listen to the interview here. One of the great pleasures of publishing DIAMONDS FROM THE DUGOUT is being able to show one's appreciation to the legends who made all those days of our lives so special. Here are two examples of beloved Yankee legends joining in the fun: Don Mattingly and Bernie Williams. Flip to their pages to see which hits they chose as their own personal favorites! 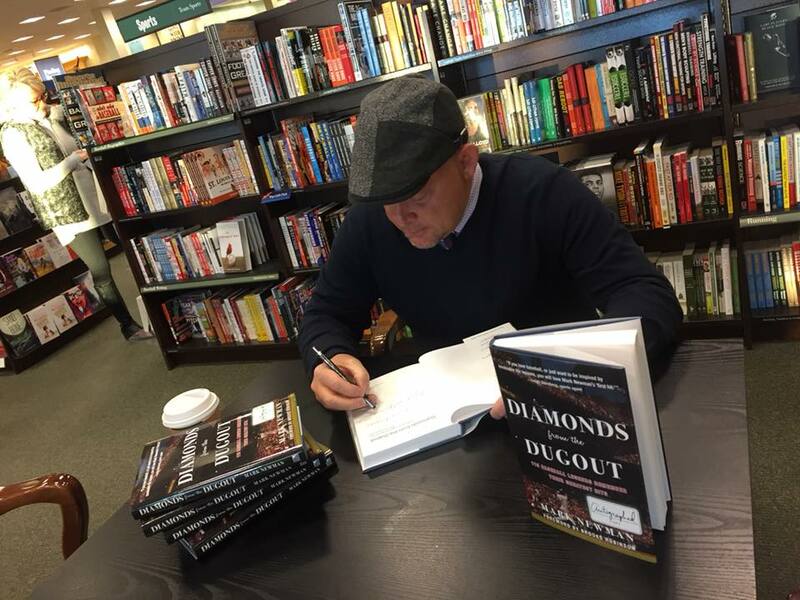 Thanks to my friends at Barnes & Noble Fort Lauderdale on North Federal for letting me sign copies of DIAMONDS FROM THE DUGOUT . . . and displaying them prominently on the Customer Information counter by the sign "Books We're Talking About". Get your signed copy now or order it online here. It was a Halloween to remember...in a World Series to remember.